Slow it. Spead it. Sink it! Roofs and other impervious surfaces alter natural hydrology, increasing the volume and velocity of stormwater runoff. This has a variety of impacts including streambank erosion, degraded wildlife habitat, potholes, structure damage, beach closures, and in severe cases, land and mud slides. Fortunately there are simple low-cost things that we can do to decrease the volume of, and minimize pollutants in, the runoff from our properties. Rain gardens and rain barrels/cisterns are two simple approaches to slow, spred and sink stormwater before it has a chance to impact local creeks. On top of those benefits, using collected rainwater instead of potable water for our outdoor water needs can help conserve municipal, instream, and ground water supplies. Rain tanks and cisterns can be placed to store water collected from roof downspouts. The stored water can be used for irrigation. 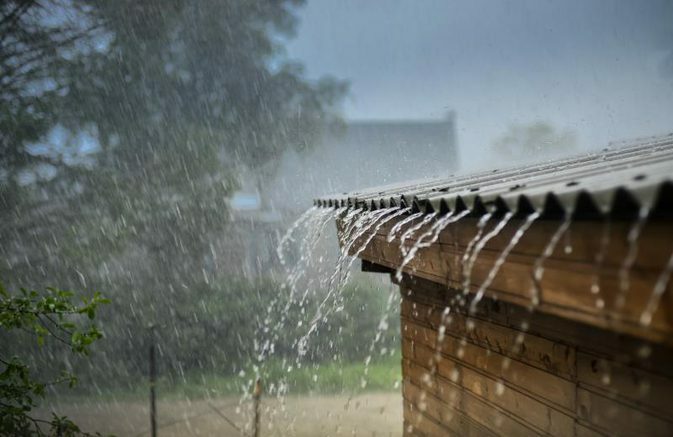 Collecting and storing water from roofs is an excellent way to SLOW water down by temporarily storing it. Captured water can be reused for irrigation or other non-potable options or metered off slowly after storm events to allow infiltration. 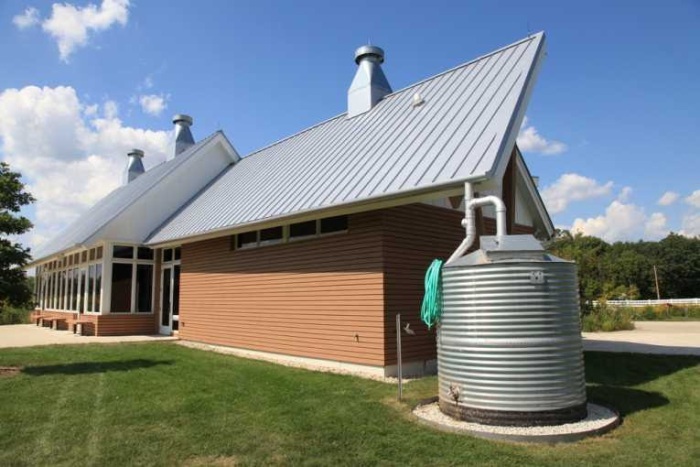 RAIN BARRELS are containers placed outside buildings and connected to roof downspouts to collect runoff for later use in non-potable applications. 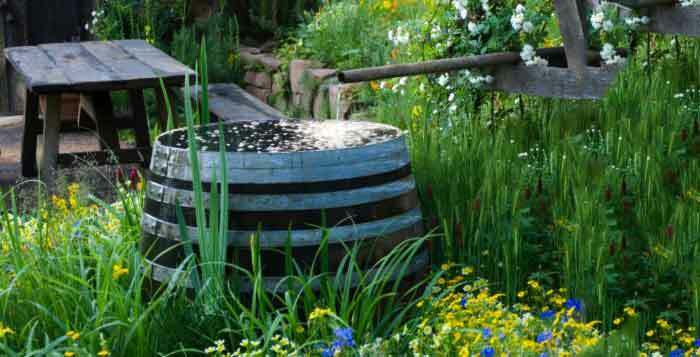 Rain barrels take up very little space, are inexpensive, and easy to install. Rain barrels conserve water and reduce the volume of runoff moving off-site. CISTERNS are manufactured water storage containers for non-potable use in residential, commercial, agricultural, or industrial applications. Water tanks can be installed both above and below ground. Some tanks come as sectional pieces that can be put together to fit different space constraints. Tanks can be used with most guttered roofs to collect runoff and reduce runoff volume. Both water tanks and rain barrels can be used without pumping devices, instead relying on gravity flow. However, depending on the desired use for the water, a pump may be necessary for best performance. Larger tanks can be designed to also function as privacy screens, fences, or small retaining walls. Tanks can also be hidden under decks or serve as the foundation for play structures or other landscape features. Get creative! Underground tanks are excellent options for areas with limited space. However, do not install underground systems beneath the path of vehicles or heavy machinery traffic unless they have been engineered for that purpose. Extra precautions may be needed when placing tanks in locations with high water tables or saturated clay soils. Contact an experienced licensed professional for tank installations. MAINTENANCE: Rain barrels require regular draining after rainstorms and removal of leaves and debris collected on screens. Always check that the overflow is clear and directed to an appropriate location. Fine mesh screens should be used to seal lids and vents. A hole larger than 1/16 of an inch can allow mosquito access and result in significant larvae production. A rain garden captures stormwater runoff from roofs, driveways, or other impervious surfaces and allows water to SINK back into the ground. It uses plants to remove pollutants and improve infiltration allowing water to soak back into the ground. In soils with low permeability this system may be used to temporarily store water (not completely infiltrate) and remove pollutants before they enter a waterway. 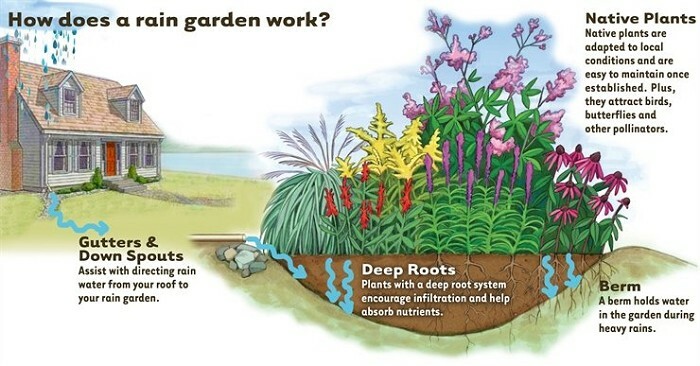 A rain garden design can be as simple as a shallow depression filled with plants that survive both moist and dry conditions. The required size, shape, and depth of the garden depend on how much water you are trying to capture. For large amounts of runoff or areas with insufficient infiltration, there are a full spectrum of engineered features, such as specialized soil mixtures, an aggregate base, and subsurface drains that can be added. Plant the center of the garden with species that tolerate wet conditions, such as native sedges and rushes. Around these, put plants suited to occasional standing water, like Yellow Monkeyflower (Mimulus guttatus) or California Aster (Aster chilensis). Rain gardens should be located at least 10 feet from your house and at least 25 feet from a septic system or steep slope. They should also be designed to drain within 48-72 hours to reduce the risk of standing water and mosquito breeding. MAINTENANCE: Routine maintenance is required. Weeding and irrigation are essential in the first couple of months while plants become established. Annual pruning and mulching are recommended. Additional irrigation may be necessary during drought years. The use of native, site-appropriate vegetation reduces the need for fertilizers, pesticides, excessive water, and overall maintenance. There are many new types of pervious materials that allow runoff to pass through and SINK back into the soil. Some popular choices are paver stones, turf block and permeable asphalts and pavements. Paver stones are normally made of pre-cast brick, concrete, stone or other material and installed over a sand base. They come in various shapes and normally interlock and can form different shapes and patterns. Pervious pavers are designed to allow more runoff to SINK into the ground than traditional pavers. Each paver has a spacer that ensures the ideal distance between placed stones for maximum infiltration. Each piece is placed with gaps between to allow the infiltration of water. Flag stones are larger and may be placed directly on the soil. A low-growing ground cover may be planted between flag stones to allow for greater infiltration. Pavers can be used in high use area such as parking lots, patios and walkways. MAINTENANCE: Keep the area clear of sediment to prevent clogging. Annual vacuum sweeping with a shop vac helps maintain permeability. The gaps between pavers may require occasional weeding or scorching and sand or gravel replenishment. Because pervious pavers are easily lifted and reset, they are easy to repair or replace. 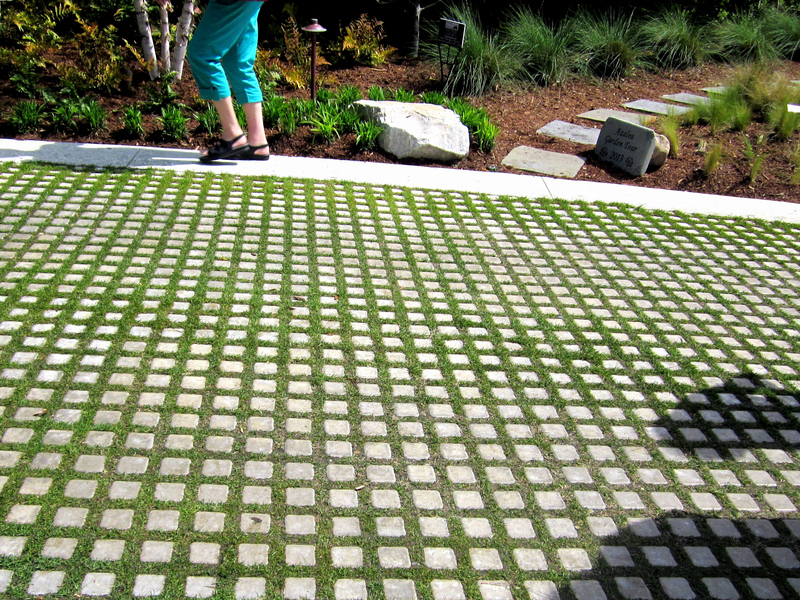 Turf block (concrete blocks with holes) and similar products can be filled with sand or planted. They provide soil stability for driveways and walkways. They are not ideal for everyday parking, because of irrigation and maintenance demands, and if they are planted, long term parking inhibits sunlight required for plant growth. MAINTENANCE: Planted turf block may require regular mowing (depending on plant choices) as well as irrigation, fertilization and weeding. Pervious pavements contain pore spaces that allow infiltration of runoff. The water seeps through the material to a rock base layer underneath and is naturally filtered through the underlying soil where pollutants are removed. There are different types of pervious (or porous) pavements including porous asphalt and pervious concrete. Pervious pavement should be located a minimum of 2 to 5 feet above the seasonally high groundwater table and at least 100 feet away from drinking water wells. Ideal uses include walkways, residential parking areas, and driveways. MAINTENANCE: Keep clear of soil, rocks, leaves, and other debris. Vacuuming annually, using a shop vac or specialized vacuum for larger areas, may be necessary to remove debris from the surface of the pavements. Other cleaning options may include power blowing and pressure washing. Always follow the manufacturer’s maintenance recommendations.